The elite community of Wailea is home to beautiful pristine beaches, top-rated golf courses, famous resort hotels, and world-renowned shopping and dining. One of the earliest master-planned communities in the United States, Wailea covers 1,500 acres of beachside property that offers the ultimate in resort living. Wailea is home to three spectacular golf courses – the Gold course designed by Robert Trent Jones, Jr.; the Emerald course, which has been hailed as one of the friendliest golf courses for women; and the Blue course – the first in the community – hailed by Golf Digest as one of America’s best resort courses. 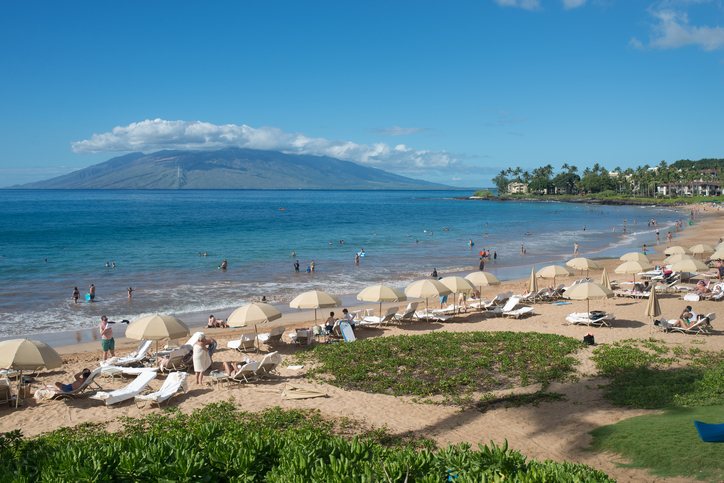 The 5 resort hotels in Wailea are the community’s premier attractions. Visited by some of the most affluent pleasure-seekers in the world, these resorts feature breathtaking beaches, luxurious rooms and villas, and amenities that include swimming pools, fitness centers, tennis courts, and the finest restaurants. While much of Wailea is immaculately landscaped and maintained, the community’s stunning beauty is anchored on its rolling green hills and crescent beaches that are often described as “perfect.” Wailea Beach was named America’s Best Beach in 1999. Other main beaches in the area are Mokapu, Ulua, and Polo, with all four beaches connected by a walking and jogging path. There are more beaches toward the southern end, where the coastline turns more rugged, and the surf gets bigger and wilder. Wailea features exclusive gated communities where you’ll find many of the most desirable and luxurious homes in Maui. Wailea homes for sale include amazing oceanfront estates that boast spacious indoor and outdoor living spaces and the most stunning views. Wailea’s subdivisions are a mix of older and newer developments, resulting in a wide range of architectural styles and features. Some neighborhoods offer custom home sites, perfect for building dream homes from the ground up. Golf communities like Wailea Fairway Estates and Wailea Golf Estates feature beautiful homes overlooking the lush green fairways of the Blue course. A number of Wailea’s subdivisions feature relatively smaller cottages, as well as villas and condos. Wailea beach condos spell luxury at every turn and are highly sought-after vacation or investment properties. Condos found further inland offer quick access to the beach and wonderful views of the ocean and/or a golf course. Some of these condos include vacation rental properties. Not all Wailea homes have an ocean view, but regardless of the location, the beaches, resorts, golf courses, and amazing shopping and dining are never more than a few minutes away. Maui’s premier shopping center features upscale stores and shops, popular brands, art galleries, and famous restaurants that offer casual and fine dining. To the south of Wailea are pristine reserves that feature the spectacular effects of Haleakala’s past eruptions. The Ahihi-Kinau Natural Area Reserve is well-known for its snorkeling area and a coastline made of lava rock and coral deposits. Further south, La Perouse Bay features amazing shoreline trails marked by tidepools, coves, and lava arches, including the popular Hoapili Trail. Are you considering buying or selling a home in Wailea? I will be happy to be your real estate guide. Give me a call at 808-214-0302 or send an email to Greg@IsleLuxury.com.